wpDiscuz comment plugin settings are located in Dashboard > Comments > Settings admin page. The sixth tab is the “Styling” tab. 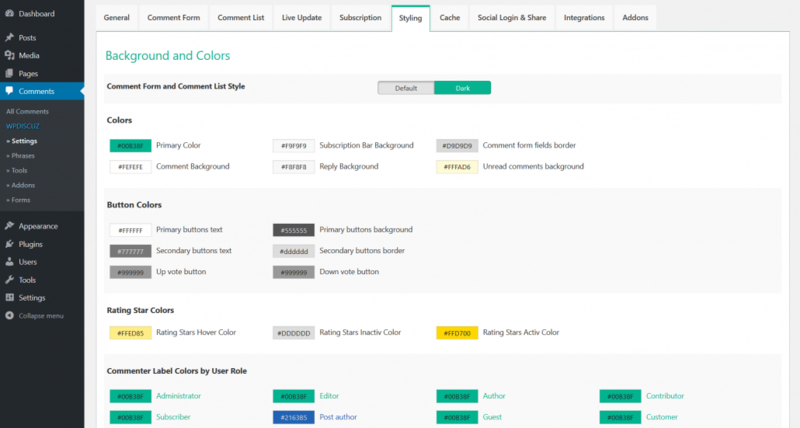 Here you can manage comment form and comment list components colors. There are two general styles: “Default” and “Dark”. We recommend switch to the Dark style if your theme stye is dark (background color is dark and font color is light). wpDiscuz Dark style should not be used with light WordPress themes. wpDiscuz detects all available user roles and lists in this setting groups to allow you manage commenter label and name colors by roles. By default they are set as the primary color. wpDiscuz uses icons provided by Font Awesome version 5 . In case, the current active WordPress theme already loads Font Awesome CSS lib, you can disable built-in wpDiscuz Font Awesome lib. Please don’t disable this lib if other loaded css lib version is lower than 5.0.10.